DS-owning music enthusiasts have quite a few tools at their disposal for composing their latest and greatest, laying down that melody that came out of nowhere for use later or just plain old messing around with bleeps and bloops. It’s great fun, but when you’ve spent a considerable amount of time on a piece in, say, Korg DS-10 or Rytmik, only to find yourself unable to get those tracks off your DS to share with others; well, that’s not a happy place to be. Now that immortal sound effect you recorded and remixed into a parakeet squawk in the Nintendo DSi Sound channel doesn’t have to go to waste! Let this guide help you alleviate these composition-sharing frustrations and force it upon let the world hear your opus. This guide doesn't apply only to DS, as the 3.5mm headphone jack is universal and available on most Nintendo handhelds (barring the Game Boy Advance SP). Why, if you have the proper adaptor you can capture your Mario Paint shenanigans following these same steps. For this guide, we're just going to use a DS. Audio-in jack on your computer. This is typically the spot where a microphone would plug in. One 3.5mm (1/8”) male-to-male cord: Can be found cheap where electronics are sold (you can also check Amazon). Sound editing program: Most computers come with one, be it Garageband or Windows Sound Recorder, but for our multi-platform demonstration purposes we’ll be using the open-source program Audacity. If you'd like to save your songs as MP3 files using Audacity then you'll need to install the LAME MP3 codec. There's a handy how-to on the Audacity site. 1. If you haven’t already, download and install Audacity from the link above. It's available for Windows, Mac OS X and Linux for the low price of free. Once installed, run the application. It should be nice and blank, as pictured. A fresh project in Audacity. 2. Get your song ready to play on your DS. Once you plug in the 3.5mm cord into your DS's headphone jack you won't be able to hear it, so make sure everything is ready. 3. Plug one end of the 3.5mm cord into your DS's headphone input, and plug the other end into the audio-in jack on your computer. If you have trouble finding it, check for a small microphone icon on the side/back of your computer. It should be the one next to where your speakers plug in. 4. With everything plugged in and your song ready to go, hit the red Record button in Audacity and then play your song. When it's finished, hit Stop in Audacity. 5. Recorded! You've probably got a few seconds of "dead air" before and after your song. Using the Selection tool in Audacity (the one that looks like a text cursor and is in use by default), highlight the dead air sections and hit Delete on your keyboard. Easy peasy. Highlight dead air with the Selection tool and and get rid of unwanted, awkward silence. This is music, not your dinner table. 6. Now you'll want to save and export your song for listening outside of Audacity. Click "File" and choose whether you want to export in WAV, MP3 or Ogg Vorbis. Saving as WAV preserves the highest quality but also creates the largest file. Ogg Vorbis and MP3 both compress and thus lose a little quality, but they make sharing easier with smaller file sizes. If exporting as MP3, fill out the relevant tag information (artist, song title, etc.) and save it. Pick your preferred file type to cement your musical excellence. Congratulations, you're a super star! Huzzah! If you want to find a wider audience for your musical creations, the Nintendo Life music podcast NLFM is currently taking submissions for user-created music. Get in touch using the Contact form and you never know, your musical masterpiece could be played to thousands of gaming fans worldwide! I've often done this with Electroplankton. man i've seen this info posted in so many places....do this many people not realize that in-line recording is for toddlers? It's quite common-sense-ey. Thanks! I bet this will work great for my records in WarioWare D.I.Y. and the sound files for my custom Bangai-O stages. Maybe now they'll be audible when I play them back. Excellent piece. Like @jangonov, common knowledge to me (would not be music creation my biggest hobby http://shiryumusic.no.sapo.pt/ ), but you have no idea how many times I had to explain these procedure to people wondering how they could export their DS-10 creations into mp3. I hope...no, I need them to make a sequel for 3DS! With so much more processing power and supposedly even better sound chip plus wider screen, I can only imagine its possibilities! -Workstation like synth too!!! Also With Karma! -OK, I started to feel a little surrealistic again, sorry. But that would be awesome!!!! but I've always been bad at these things, but I might as well give it a shot so I can try to start remixing Zelda songs!!! 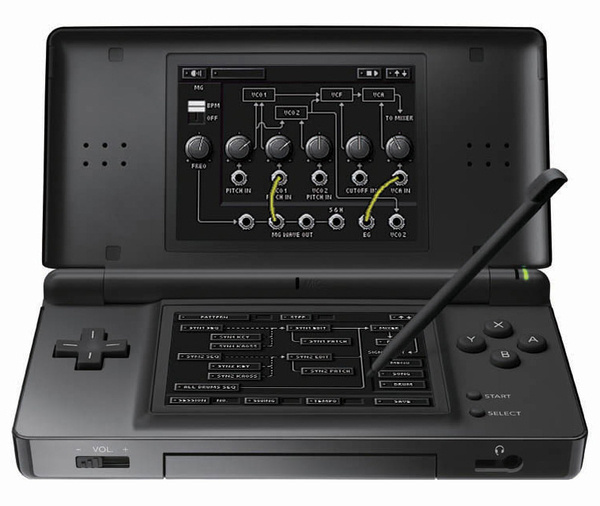 i never really saw the point of upgrading to a dsi, but every time someone releases a new music tool for the system (especially the ds-10 plus) i get jealous. it seems like there should be a way to send audio data via wireless. recording through a headphone jack doesn't give you the cleanest audio, but it's serviceable. i've released music that features drum tracks and basslines straight out of ds-10 through the headphone jack. search itunes for "so this is olympus" or "agnostic country singer" if you want to give 'em a listen. If your computer has an existing audio input (typically a 1/8-inch mini-jack), you could just use an adapter to make your guitar cable fit, but that's not ideal. To get the optimal tone, it's best to use an intermediary device or interface. An audio interface digitally converts your voice and guitar into data-the stuff that can be stored and retrieved on your hard drive, manipulated onscreen, and then sent to speakers, the Internet, or a recordable CD. Traditionally, an interface is a "box" with a bunch of jacks that accept microphone and guitar inputs (for recording with your guitar's pickup). You plug your mic or guitar into the box and it converts the analog signals (i.e., your music) into digital data. That data is sent to the computer via a USB or FireWire cable, which plugs directly into the computer's corresponding USB or FireWire ports. Audio interfaces usually include multiple kinds of connections (XLR, 1/4-inch, headphones), level-matching knobs and switches, phantom power (for condenser mics), and other bells and whistles. And thus ends the copied and pasted section. If you are looking for the best quality capture, then this would be the way to do it. Another way would be to plug into an external multiple-track recorder. Those run a big range in price but could be simpler in some ways. thanks for the information, that's really nice of you. 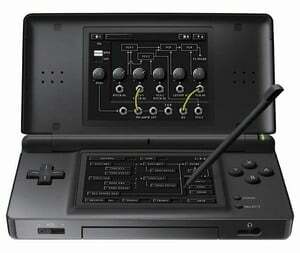 the quality problem i was talking about has to do with the the only ds output, the headphone jack. you can use a digital converter box that connects via firewire or usb, but i don't think you'd get any better quality than just plugging the ds straight into your soundcard with an 1/8 stereo cord like this NL artical suggested. i personally did use a "bridge" device, my 8 track mixer, before sending the signal to my pc. that was just so i could play with the eq and record other instruments. what i was suggesting is that the ds could send digital audio wirelessly. no conversion means no loss in quality. if the ds had usb, optical, or firewire out, it could be done that way too. every headphone out jack has built in amplification, in this case controlled by the volume knob, and this little amp almost always creates a buzzing noise in the line. if you follow this guide you will hear it. it can be cut out by tweaking the volume knob or eq either on your bridge device or the eq in your recording software, but not eliminated. By the way you can check out some Rytmik songs I wrote on youtube, search for Ian Uniacke. @cinemaxgames I cant wait for it to come out. Hope nintendo approves it soon. Awesome article, thanks for this Panda. I already have Audacity and it rocks! Any chance this would work with WarioWare DIY? I have loads, actually: two in my PC, two sat in a drawer and one to connect my speakers to my laptop. I love cables, though. I have a male to male extension cord plugged on my laptop and 3DS... record it with audacity but nothing happened! D: no flipping sound what so ever. all it have for a microphone is the laptop with a built in microphone... above the screen! I am doing music with rytmik retrobits with a 3DS connected to the headset plug of the laptop with a male to male cord so I can record the song I made on 3DS to a laptop. but somethings wrong here... no sound came from 3DS to laptop... help me out? @Magicpegasus I am doing music with rytmik retrobits with a 3DS connected to the headset plug of the laptop with a male to male cord so I can record the song I made on 3DS to a laptop. but somethings wrong here... no sound came from 3DS to laptop... help me out? my guess would be the headset plug on the laptop is the problem. these are usually combo stereo-out mono-in inputs. The end of a headset cord, like one you'd use with your phone, has three black stripes on it instead of two. I find these types of inputs problematic, but there's probably a way to make it work with an adapter. You're much better off getting a usb audio input device. I use a small behringer usb-powered mixer with my laptop. If you have access to a desktop, most of those have normal stereo line inputs that will work with the stereo cord you have. Help! I did this and it wont let me do it in audacity but I did it with sony vegas pro 13 which recorded fine. also the sound comes out of my pc speakers and sounds fine but when i play back the recording, it starts off fine but begins to sound like an old radio. It gets quieter and loses its emphasis and weakens the sound.